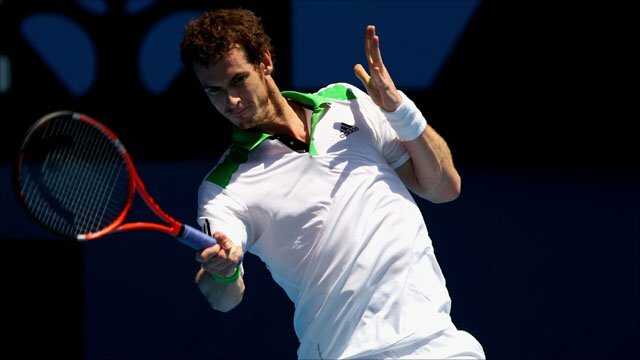 Britain's Andy Murray continued his serene progress at the Australian Open with a straight sets demolition of Guillermo Garcia-Lopez in round three. World number five Murray tore the 32nd seed to shreds with eight breaks of serve in his 6-1 6-1 6-2 triumph. Murray was broken once in the first set but had no further problems and came through in one hour 32 minutes. The 23-year-old Scot, still yet to drop a set at the event, next plays Jurgen Melzer who beat Marcos Baghdatis. "It was a very good match," Murray told BBC Sport straight after his win. "He's a tough player but I played well. I didn't give him many chances on my serve so I'm happy. "My intensity has been good so when I play the tougher matches I think I'll be OK. If I can keep up my intensity I'll have a good chance." Murray, who saw off Karol Beck and Illya Marchenko in rounds one and two, added: "I have played very well in every match. "It is difficult to concentrate for long periods in this heat. I've won my matches in straight sets but it's definitely a lot harder than the scoreline suggest." Murray beat Garcia-Lopez 6-4 6-4 in their only previous meeting, at Queen's in June 2009, and knows him well from time they have spent practising together. Such familiarity looked as if it might play into the Spaniard's hands as he stunned the crowd with a through-the-legs winner en route to a 40-0 lead in game one. But Murray clearly had other ideas and fought back aggressively to deuce before breaking serve when Garcia-Lopez clipped a forehand into the tramlines. He swiftly sealed the double-break, set up by a backhand return winner up the line, followed by his opponent dumping a meek forehand into the net. Garcia-Lopez, who beat Rafael Nadal on the way to winning the Thailand Open in October, hit back to reduce the deficit - only for his service woes to return in game five. Murray was targeting the 27-year-old's second delivery with huge success and he brilliantly chased down a drop shot to earn another break point, which was converted for a 4-1 lead. The Scot broke for the fourth time to seal a 24-minute opening set and picked up where he left off at the start of the second. Murray worked hard in the off-season on his delivery and he was beginning to reap the rewards, keeping his first serve percentage above 60% throughout and denying Garcia-Lopez a look-in. The right-hander from Albacete simply could not cope with Murray's power, precision, variety or movement and, as in the first set, the British number one cantered into a 3-0 lead. After firing long with an overhead from the baseline to concede the double-break in game four, Garcia-Lopez vented his frustration by smashing the ball high into the air. There were ironic cheers for the Spaniard when, in game six, he held serve for the first time in the match, but Murray saw off the set with ease to extend his advantage to two sets. Garcia-Lopez finally found an element of consistency at the beginning of the third set and had Murray scampering all over the court to retrieve a series of well-placed groundstrokes. However, two booming aces secured Murray a strong hold in game four and he took his chance to pounce in a like-for-like repeat of the first game of the match. Garcia-Lopez was again reeled in from 40-0, conceded a break point and skewed wide with a return. An emphatic forehand winner to the deuce court gave Murray a 5-2 lead and he completed his victory with a running forehand put-away.